Visit Range Hoods Inc today for 25% off select items. This entry was posted in Home Improvement, Humor, Range Hoods and tagged Black Friday, deal, kitchen, range hood, range hoods inc, sale on November 28, 2014 by editor. Eating at Home Vs Eating Out is an infographic provided by Range Hoods Inc that explores the benefits and risks of both preparing homemade meals and eating out at restaurants. This entry was posted in Cooking, Food, Kitchen Safety, Range Hoods and tagged cooking, food, food safety, health, kitchen, kitchen safety, range hood, range hoods inc on November 28, 2014 by editor. Thanksgiving can be a stress inducing holiday. On top of the stress, if you forget an important ingredient for Thanksgiving dinner, you most likely won’t find a store that’s open on that fourth Thursday of November. Yet, Thanksgiving is one of the most enjoyable holidays. By the end, everyone will have full tummies and feel happy to spend the day together. Think of this Thanksgiving handbook as your starter guide to surviving this holiday. Don’t forget to try some DIY Kitchen Projects to spruce up your kitchen before your guests arrive. Enjoy the following décor, recipes and tips for one of the best holidays of the year. Dress up your dining room table this year with some simple projects. First, have you ever used printables? This Thanksgiving Free Printable Quote & Utensil Holder from Craftaholics Anonymous will add a personal touch to your table setting. 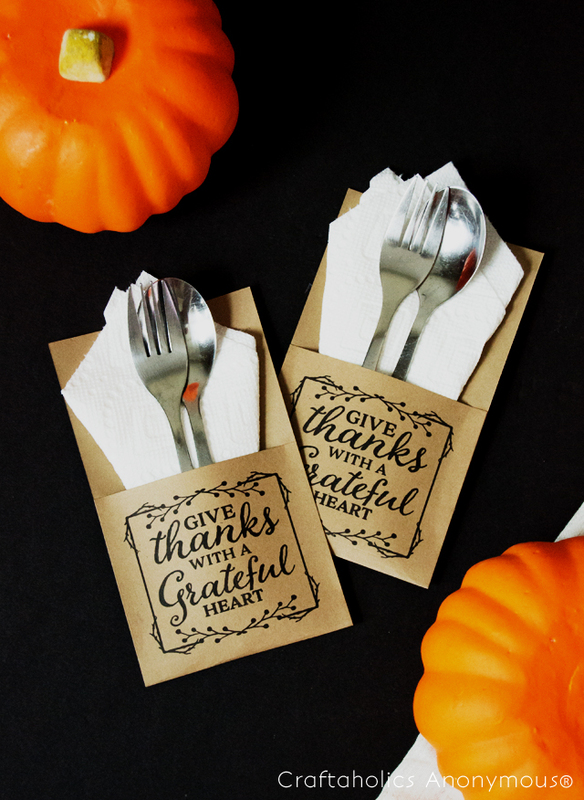 Aki of Minted Strawberry designed these little reminders of what Thanksgiving is all about. Aki also included a small poster, which you can frame and hang on the wall or display on the kitchen counter. A dinner table is not complete without a centerpiece like the DIY Thanksgiving Centerpiece Pumpkin Vase from Everyday Occasions, by Jenny Steffens Hobick. Jenny explains how to cut the top of the pumpkin so you can fit a glass vase inside. Put some foam and water inside of the vase and arrange flowers to your heart’s content. Jenny used roses, broom cob and mums to create an elegant bouquet for the Thanksgiving dinner table. Jenny also recommends storing the bouquet in the refrigerator until it’s time to serve dinner. Place the pumpkin on top of a silver platter for a special fall look that will help create a memorable dinner. Note, it helps to choose flowers that complement your dining room décor. This fun project was originally given to the author of the blog Revel as a hostess gift. You can create Gourdeous Candle Holders by going to the grocery store, or the pumpkin patch, for some miniature pumpkins and gourds. Cut the bottom of the pumpkins so they sit flat on the table; you wouldn’t want any candles falling over. Using a spade drill, drill the top of each pumpkin just enough to fit a tea light. Drill a space that’s just big enough for the height of the candle. Now have fun mixing and matching different colors and sizes of pumpkins and gourds and placing them out on the dining room table. These hurricane vases decorated with natural ingredients will look amazing during this fall season. 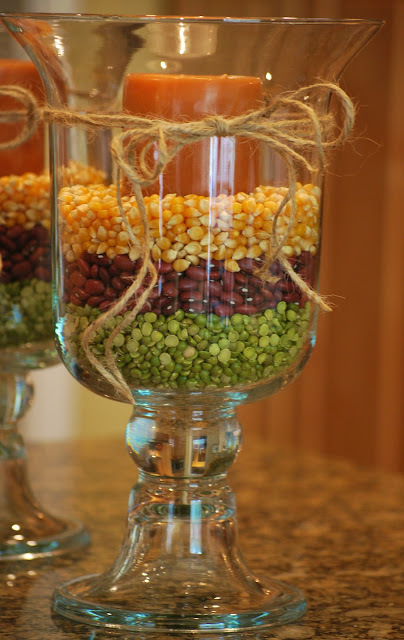 Amanda Jane Brown used corn kernels, small red beans and split peas from Great Value to create a unique look. Put the candle in first and then layer the beans as you’d like. Amanda also tied jute string around the top of each vase. You can achieve this effect with or without the candle. Elements of Style posted this project in a collection of placeholders titled In Your Place. These placeholders are super easy to make out of leaves. Just grab some dried leaves from the backyard. You can spray paint them gold or silver, or just use them as is if they have a good color. Use paint pens to write the person’s name for each place. Keep in mind which colors will go with your dining room and the rest of the décor at your table. Mini Pumpkin Pies are all the rage this year. In addition to being cute, these small pies help with portion control. Home Is Where the Boat Is published this recipe, which uses store bought pie crust, one can of pumpkin puree, sweetened condensed milk, eggs and Pumpkin Pie Spice. This is as easy as it gets. Make four inch mini pie crusts using a four inch cookie cutter or bowl, and place them inside a greased muffin tin. Add pie filling and top with cut out leaves made out of leftover pie crust. Follow Mary’s directions for baking and enjoy these small treats on Thanksgiving. You can also use your own pie filling recipe if you’d like. 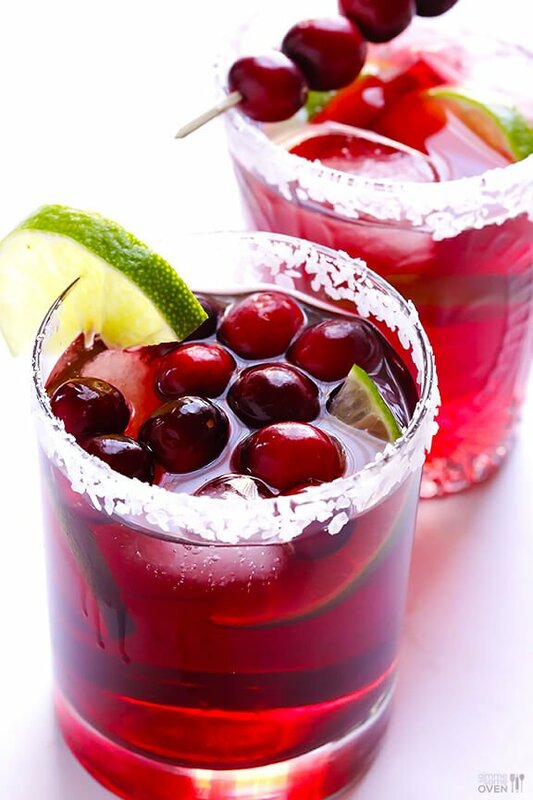 Beat some of that Thanksgiving stress with one of these fabulous Cranberry Margaritas from Gimme Some Oven. Ali explains how to make a fall themed margarita using cranberry juice cocktail (or homemade juice if you prefer), lime juice, orange-flavored liqueur and tequila. Add ice cubes or use crushed ice. Top with some cranberries and lime slices for garnish, and enjoy your holiday in style. 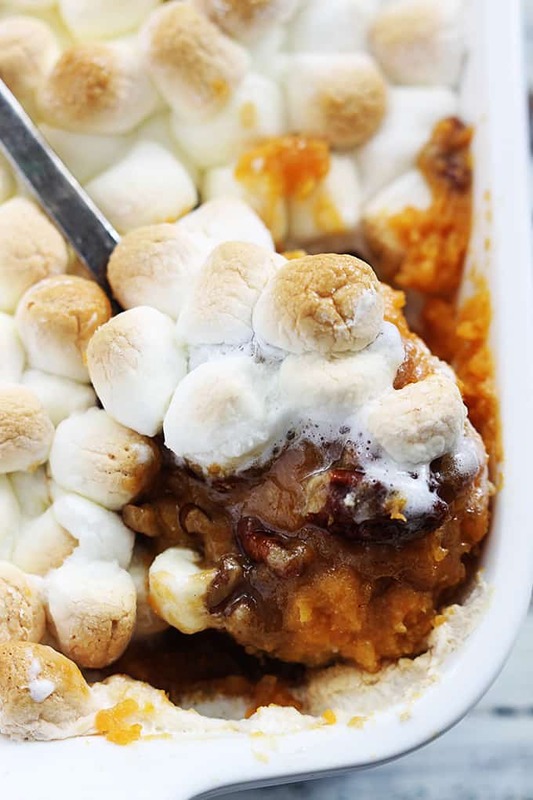 The sweet potato soufflé has to be one of the most sought after Thanksgiving dishes and is the one that always runs out towards the end of the night. This delicious looking version comes from Tiffany at Crème de la Crumb. Boil some sweet potatoes and mash them. Add eggs, melted butter, brown sugar, vanilla, salt and milk; mix it all together. Pour this mixture into a baking dish and add brown sugar, melted butter, flour and pecans on top. This will turn into a candied pecan topping in the oven. Follow Tiffany’s instructions for baking and add the marshmallows for the last five minutes. Trust us; this will be everyone’s favorite this year. 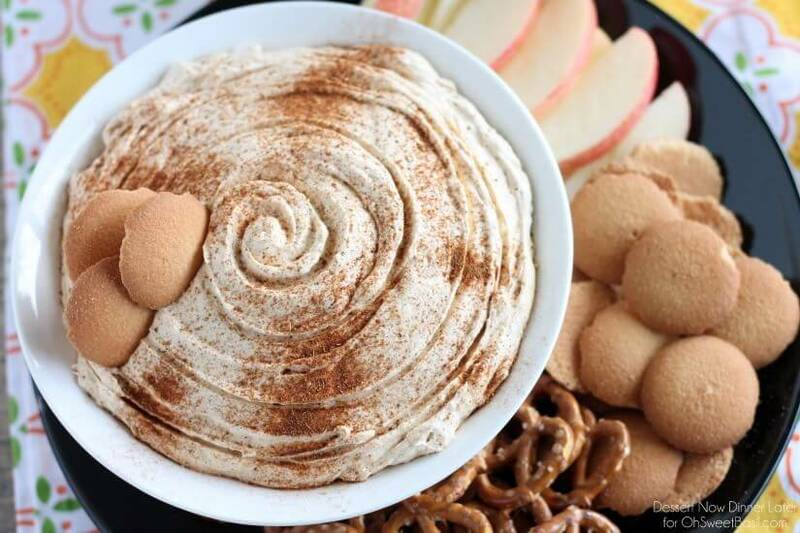 This Pumpkin Cheesecake Dip is a playful creation from Amber of Dessert Now; it was posted on Oh, Sweet Basil. This isn’t the usual savory dip you may expect. It’s reminiscent of an actual slice of cheesecake. Beat cream cheese with powdered sugar, mix in pumpkin puree and pie spice, and beat in some Cool Whip. Sprinkle some cinnamon on top, and eat with cookies, pretzels, apples or whatever you think fits! Perhaps you want to try something new and not make the same mashed potatoes again this year. 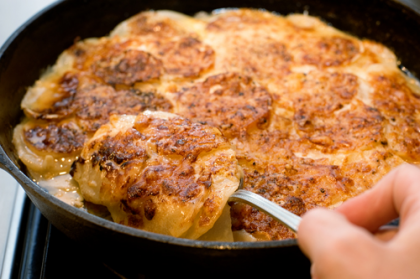 This Turnip Gratin recipe from The Pioneer Woman will be the perfect way to switch things up. You just need to peel turnips, cut them into thin slices, grate some Gruyere cheese and layer it all together with butter, chicken broth, minced garlic and cream. These cheesy, delectable turnips will be a big hit at the table. -Make a shopping list and triple check it. You don’t want to be stuck in a busy store the night before. -Take items out of your fridge, and store them in a cooler to make more space for Thanksgiving dishes. -Do you cry while chopping onions? Cut an onion in half, and rub the halves together under cool water before dicing it. -Buy dessert from the store, or asks guests to bring a sweet dish. Don’t get overwhelmed by trying to do too many things; let people help out by bringing a pie or a cheesecake. -Cut up the vegetables the day before, and keep them in Ziplocs in the fridge until it’s time to put the recipes together. -Ask the butcher to butterfly the turkey and cook it with both sides down. This is a much faster way to roast a turkey. -Use disposable plates and napkins to avoid the massive clean up later. You can find some with charming patterns on them. -Make your house smell wonderful before your guests arrive by boiling a pot of water and throwing in whole cloves, orange rind, whole star anise and cinnamon sticks. -Put out disposable cups, and have everyone write their name on their cups to avoid having to clean up a bunch of empty cups at the end of the night. -Lay out the food buffet style, and let people serve themselves. This saves space on the dining room table for centerpieces, drinks and elbow room. Also, you won’t have to plate everything yourself. -Don’t put the potatoes on the stove. Microwave them to free up one of the burners. -Have Chinese takeout boxes on hand, and let your guests pack their own leftovers. Last of all, remember to have fun! It may be stressful at times, but Thanksgiving is one of the best days of the year. We can’t wait for the celebration to begin, to dig into the turkey and sip on a cranberry cocktail. Happy Thanksgiving! …when your kitchen smells like bacon. This entry was posted in Uncategorized on November 21, 2014 by editor. A kitchen remodel can be expensive, but you don’t have to completely remodel your kitchen to make it look new or to give it some fresh updated looks. Get the luxury kitchen you want for a smaller price tag with some fun, do-it-yourself projects. These projects will be a fraction of the cost of major renovations and remodeling. Another plus to updating your kitchen is the opportunity to personalize your space to your taste and your preferences. Ideally, we would all buy brand new appliances when ours become outdated. However, the reality is that buying new appliances is very costly. Fortunately, you can use a small budget to dress up your current appliances without having to replace them or buy new ones. 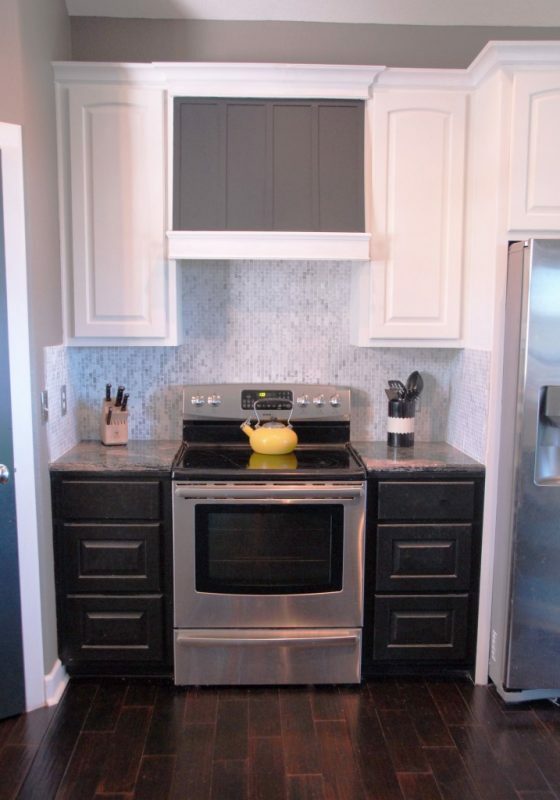 In this project posted on Remodelaholic, Jill of The Rozy Home figured out a creative way to cover up the boring microwave range hood and brown cabinets in her kitchen. Visit Remodelaholic for the before and after photos, and you won’t be able to believe it’s the same kitchen. First, Jill painted the brown cabinets white. She pulled out the microwave and replaced it with a hidden range hood. She took out the cabinet above the range and covered the range hood with a creation made of different pieces of wood, liquid nail, lattice and trim pieces. She sanded it, primed it and painted it. The result is an elegant range hood and a kitchen that looks brand new. All of this was accomplished for the cost of paint and a small amount of wood. Buying a new fridge may not be in the cards, but that doesn’t mean you have to live with a fridge you’re unhappy with. If you’re tired of your fridge, you can dress it up with chalkboard paint, stickers, removable wallpaper or anything your heart desires. Give the fridge some personality and cover up any yellowing areas or stains. 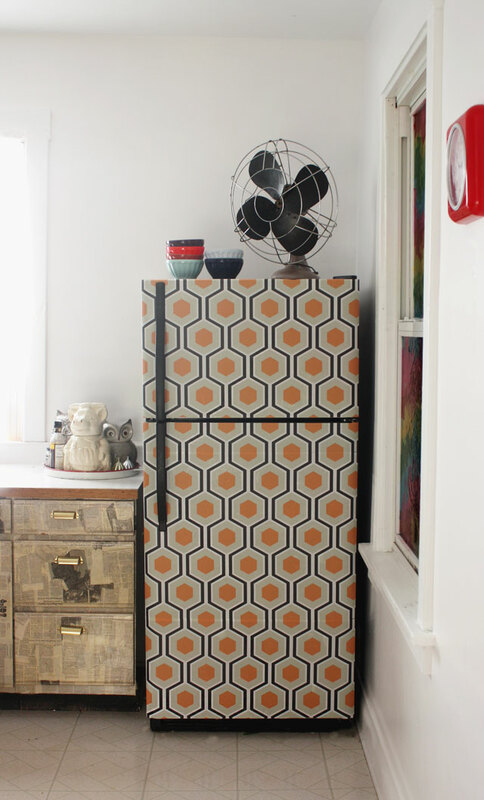 In a post on Apartment Therapy, Megan and Kit needed an update to the old fridge in their apartment. With their landlord’s permission, they painted the fridge with a chevron pattern with Rust-oleum chalkboard base. The result is a beautiful fridge with multi-colored chalkboard paint in a fun and trendy pattern. This project beats buying a new fridge, and it helps add style and personality to a kitchen. The backsplash goes all around the kitchen; giving it a fresh look can make a big impact in the whole room. Don’t overlook the possibilities. There are so many directions in which you can go with a kitchen backsplash. When it comes to backsplashes, there’s a never-ending list of materials you can use and ways in which you can use them. You can re-tile your backsplash inexpensively with sheets of tile. Alternatively, make a mosaic on the backsplash above the range for a personalized focal point in the kitchen design. Make your kitchen look one-of-a-kind. Another inexpensive alternative to replacing the backsplash is using tile decals to add decoration to the tiles that are already there. Think about how great your kitchen can look with a DIY backsplash above granite kitchen counter tops. The picture above is from Jessica’s post on The Lovely Side. Jessica explains how renters can dress up their backsplashes with temporary options. These methods are also affordable. The above option is a temporary metal backsplash. Jessica also recommends removable wallpaper, fabric, place mats, chalkboard decals and vinyl tiles. Make sure that any adhesive used can be removed when you move out of the apartment or house. As pointed out in Jill’s range hood project in the first section of this blog, painting the kitchen cabinets is an affordable project that can make a kitchen feel new. A new coat of paint can drastically improve the look of the cabinets without having to replace them, which is very costly. The cabinets pictured above are from Virginia’s post on Live Love DIY. Virginia walks you through how to paint your kitchen cabinets. Her cabinets look amazing with a fresh coat of paint and brand new hardware. Read Virginia’s guide on painting kitchen cabinets to figure out everything you need to buy and everything you need to do. In essence, you will be removing all doors and hardware, sanding the doors and frame, filling holes with wood filler, sanding the wood filler, caulking the seams, priming, painting, sanding again, finishing, putting the doors back on and installing new hardware. Don’t forget, you can also add crown molding around existing cabinets to make them look custom made. Why stop at the cabinets? A new coat of paint can do wonders to a room. 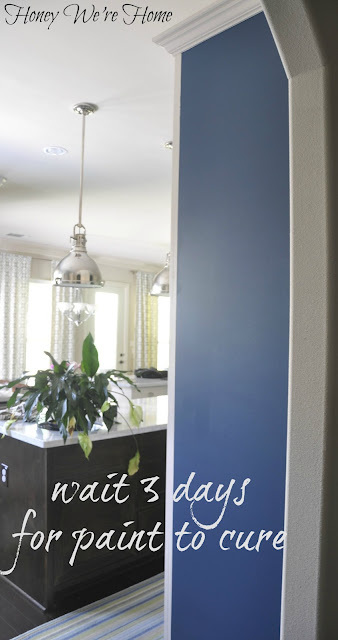 While getting ready to repaint your kitchen, you can decide if you want to paint an accent wall. Go crazy and paint the ceiling a unique color. Or you can just freshen up the paint color you have now for a nice, finished look. Don’t forget chalkboard paint. You can paint an entire wall or the entire fridge. Use the chalkboard wall to write down recipes, menus, doodles, notes for one another or create a calendar and schedule for the whole family. Megan of Honey We’re Home used Benjamin Moore chalkboard paint in the color Summer Nights to create the beautiful accent wall pictured above. Now her son can write on the wall while she cooks. When there’s no chalk on it, it looks like a regular wall inside an elegant kitchen design. You will be surprised at how much of a difference simply changing out the faucet can make. Change out older faucets on your kitchen sink. You might even want to go with touch-free technology, which is more hygienic and makes working in the kitchen faster. The same logic above about the kitchen faucet holds true for the lighting in your kitchen. Change out old lighting fixtures for updated and contemporary designs. If it’s in your budget, you can also install task lighting. Several layers of lighting make a big impression in the kitchen and make preparing food easier. Adding storage space to your kitchen can help cut down on clutter and clear your counter tops. This will definitely make your kitchen look more appealing and make it more functional. Kitchen storage can be added with a few DIY projects. Build your own kitchen island, add open shelving to the walls and design a pull out pantry. The possibilities are endless. The following are some examples of kitchen DIY storage. Purchase a kitchen cart. These are inexpensive and create more space for storage and preparation in your kitchen. When you’re not using it, it will fit nicely into a corner. Recycle an old door like in the project above from C.R.A.F.T. Jaime was renting and needed kitchen storage that didn’t require putting holes in the wall. She spray painted this door and added some Command hooks. Now, she can store utensils, pot holders, spices and dish towels on the door, which frees up her drawer space. This kitchen peg board project comes from Emma at A Beautiful Mess. Emma added storage to her kitchen by purchasing a peg board, painting it and mounting it to the wall with bracing wood. She also used a white paint pen to outline the items she decided to store on the peg board. To increase storage space, also consider installing a pot rack. This will open up space in the kitchen cabinets for appliances and other items. Lastly, you can upcycle old furniture in your home or that you find at the thrift store and turn it into something new. For example, turn an old dresser into a DIY sideboard by sanding it, repainting it and decorating it with new hardware. 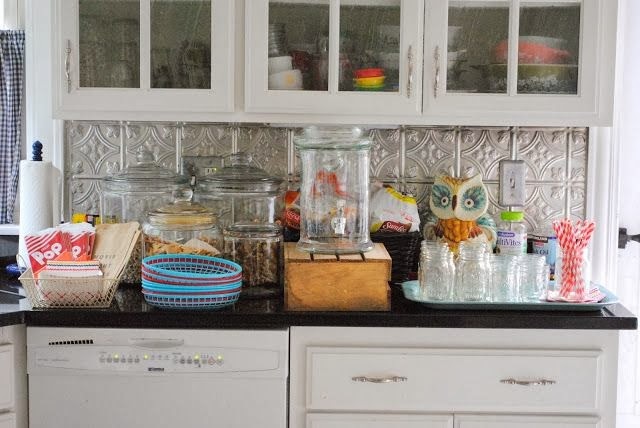 Making an old kitchen look new can be fun and easy with the DIY projects we covered. Just remember that your kitchen should be a place where you enjoy spending time and preparing your meals. Don’t let a small budget worry you; design a kitchen you can love. This entry was posted in Home Improvement, Kitchen Design, Kitchen DIY, Range Hoods and tagged diy, do it yourself, interior design, kitchen, kitchen design on November 21, 2014 by editor. This entry was posted in Home Improvement, Humor, Range Hoods and tagged funny, humor, kitchen, range hood, range hoods inc on November 14, 2014 by editor. Everyone has areas in their kitchen that they aren’t completely happy with. That’s why DIY projects are accessible ways to organize and modernize kitchens at a small cost. DIY kitchen projects are also a fun way to pass the time and make memories. Start with some of the following DIY projects in your kitchen. Soon, you’ll be DIYing all the time, whether it’s dressing up the kitchen range hood, adding storage, painting cabinets or creating a community chalkboard. This storage project from Classy Clutter is great for increasing space in small kitchens. In a small kitchen, you have to make every bit of space count when you’re trying to stay organized and have a full pantry at hand. 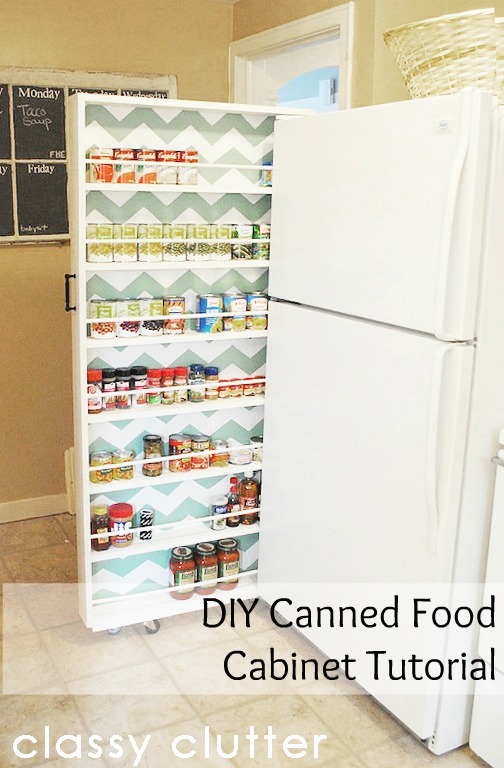 The sliding cabinet is basically a set of little homemade shelves on wheels with a handle that pops out of the space between the fridge and the wall. You can customize this to your liking. First, paint your design of choice onto the backboard. Then, pick out the handle that best speaks to your personality and kitchen décor. You can also paint the cabinet the color of your choice. Now you can have a shelf dedicated to canned soup, marinara and spices. We have no idea what DIYers ever did without chalkboard paint. This stuff is so versatile and can add personality to almost any space. 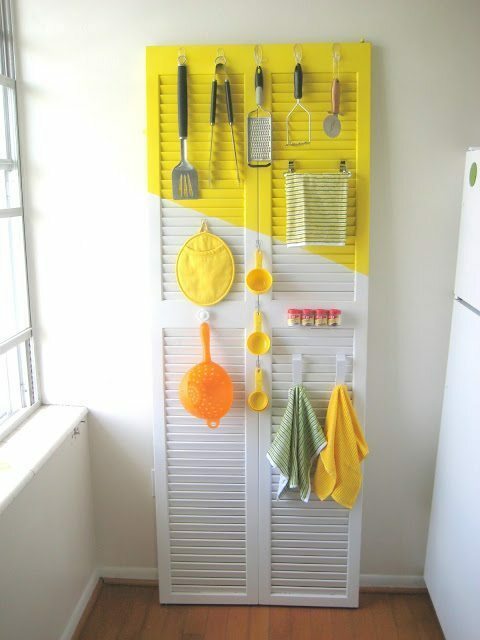 You can paint a cabinet door, like in the photo above from Funky Junk Interiors, to create an impromptu shopping list. Alternatively, you can doodle there or leave notes for other people in the house. Get crazy and cover the entire fridge in chalkboard paint. Leave memos to each other and start a mural. Some families choose to paint an entire wall with chalkboard paint. The wall can be used to create a calendar or a space for children to draw while the parents cook in the kitchen. Painting the back splash with chalkboard paint allows you to write a recipe on the wall or track ingredients when making your own creations in the kitchen. You can then save those recipes for later. This kitchen chalkboard menu DIY project comes from Adventures of a DIY Mom. 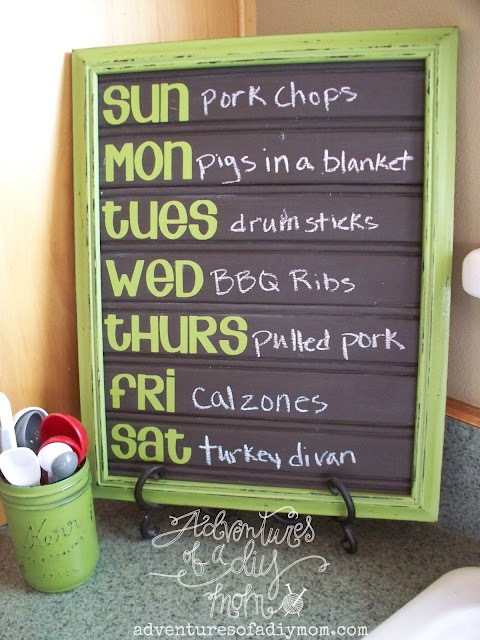 This cute menu can go on the kitchen counter and can help the family plan out the week’s meals. To make this reusable menu, you need bead board, paint, a large picture frame, vinyl letters, chalkboard paint and a jigsaw. You can even use chalkboard paint that comes in different colors for a unique and creative look. Remember to paint the picture frame; you can sand it down in areas for a rustic or vintage look as well. You can easily update your existing kitchen cabinets without having to replace them by painting them a new color. 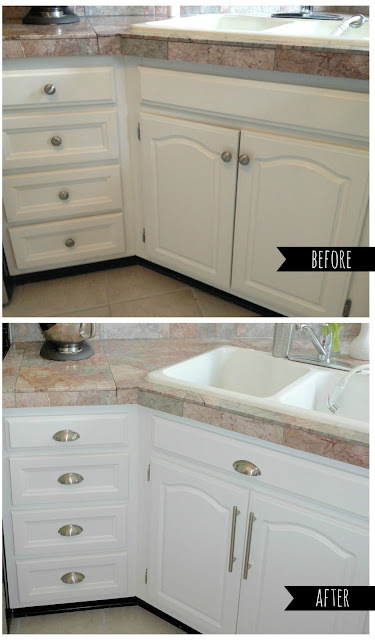 This is an inexpensive alternative to installing new cabinets. Also, consider taking the doors off of your cabinets for an open cabinet look. Then, you’ll be able to display your favorite pieces and dishes with gusto. A new kitchen island will increase counter space in the kitchen and give you more room to prepare food. It can also add storage space to a small kitchen or create a place for you to display your favorite cook books. 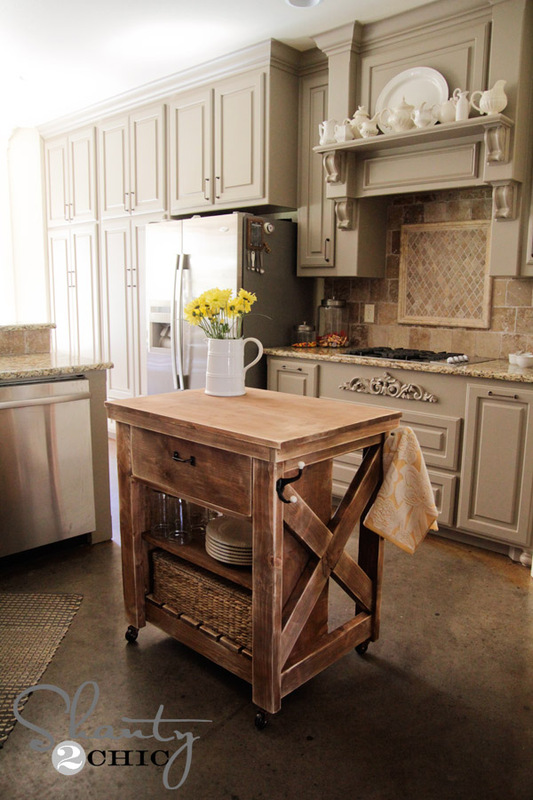 This DIY kitchen island on Shanty 2 Chic was inspired by a Pottery Barn; this version only cost $85 to put together. To learn how to build it, visit the description on Shanty 2 Chic. This piece was finished with Rust-Oleum Ultimate Wood Stain in Early American. The hardware was taken from inexpensive items found at Home Goods, and the casters are from a local hardware store. Note that a kreg jig was used to put the island together. This Cleverly Simple project makes random wooden utensils look like they came in the same set. This was originally presented as an idea for a Mother’s Day gift. These are inexpensive bamboo kitchen spoons that were painted with two coats of acrylic paint. Be sure not to get paint on the part of the spoon that will come into contact with food. Let the paint dry overnight before spray painting the handle with gloss. Stick the spoons in mugs, so they won’t move around while the paint is drying. 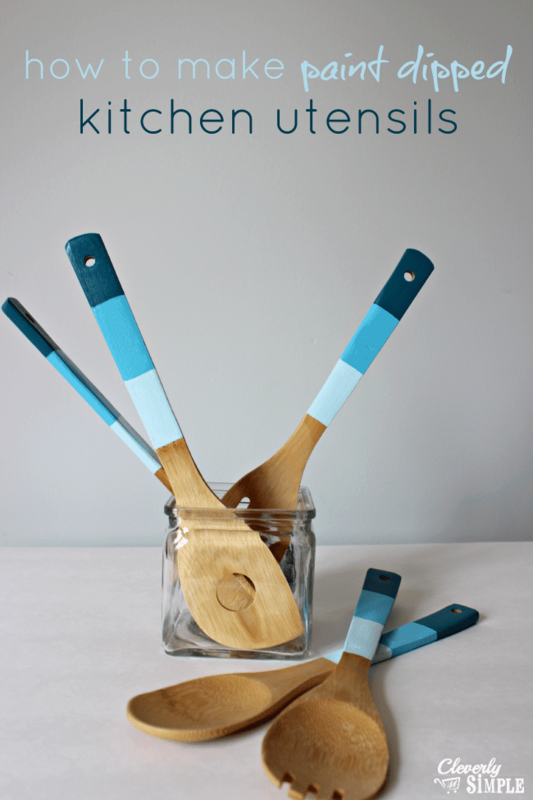 You can also use the same method to paint the edges of a wooden cutting board to match your new and improved spoons. We’ve gone over painting the fridge with chalkboard paint, but if a fun pattern is more your style, you can dress up the fridge with removable wallpaper. Aunt Peaches wrote about this easy and amazing project that will make your fridge fabulous and memorable. Maybe you’re bored with your fridge or want your kitchen to fit the current design trends; there’s nothing wrong with that. This is also a great way to hide stains or yellowing on older refrigerator units. You can also remove the wallpaper and recover it with a new pattern if you get sick of the wallpaper you chose. Just remove the handles on your fridge and stick on the removable wallpaper. You can lift it up and readjust it as well. Put the handles back on, and admire your handy work. As we mentioned earlier, every bit of space in a small kitchen matters, so make it count. Take that spice rack off of the kitchen counter, and throw it up under the cabinet. Just glue magnets to the top of the lids of your spice bottles, and glue a magnetic strip to the bottom of the cabinet, as illustrated in the photo above from BuzzFeed. Now you have a handy spice rack that doesn’t take up any counter space or drawer space. Your spices should be easy to find when you need them. Practically Functional offers another version of a magnetic spice tin organizer. This version uses a sheet of tin from the hardware store, decorative paper, Mod Podge, labels and spice containers. This organizer is mounted to the inside of the cabinet door, which is also a neat trick for saving space in the kitchen. The tin sheet is covered in decorative paper and screwed onto the back of the cabinet door. If the spice containers are metal, they may already stick to the tin sheet. If not, you can glue magnets to the bottoms of the containers. Remember to label the containers as well. Here’s another easy project for the back of the cabinet door from Better Homes and Gardens. 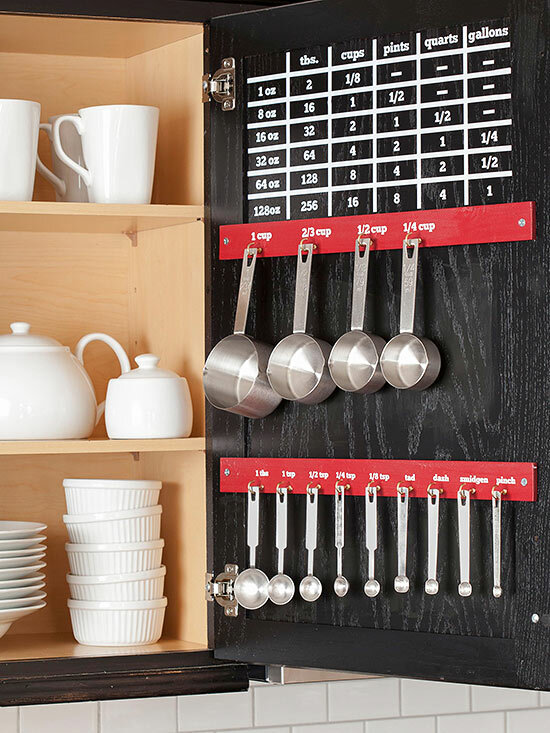 Use hooks and labels to organize your measuring spoons and measuring cups. Now they’re easy to find and organized for when you need them. Also, put up a measuring chart, so you can instantly convert measurements while cooking. Again, placing it on the back of the door saves space in other areas of the kitchen. HGTV posted this charming DIY note pad that can be used as a kitchen shopping list. The project uses a piece of wood board, scraps of decorative paper, ribbon or rope, a small piece of webbing or strapping, a clip, a pen or pencil, a large rubber band and a small roll of paper. The great thing about this do-it-yourself project is that it can be made entirely with recycled parts. An old roll of receipt paper would be perfect for this. First, cover the wood board in decorative paper. This is where you get to be unique and creative. Then, use a thumbtack to attach the piece of webbing in a loop shape. This becomes the pencil/pen holder. Next, loop the ribbon through the roll of paper and clip the ribbon to the top of the board. Roll out the paper to the end of the board and secure it down with the large rubber band. You can mount the board to the kitchen wall for an easy shopping list that you can tear off right before going to the store. Alternatively, use it for writing down phone messages, leaving notes and/or doodling. Once you start these DIY projects for your kitchen, it will be hard to stop. It’s exciting and rewarding to know that something you did yourself made life better in your kitchen. You can also switch out small things in your kitchen. This is an easy and inexpensive way to update your kitchen and make it feel new. These small projects include replacing the kitchen faucet, changing out the hardware on your cabinets and installing new lighting fixtures. You don’t have to break the bank or undertake a complicated project to update your kitchen and make it feel new. Good luck in your DIY endeavors. This entry was posted in Home Improvement, Kitchen Design, Kitchen DIY, Range Hoods and tagged diy, kitchen, organization, range hood, range hoods inc, storage on November 14, 2014 by editor. What are Ducted & Ductless Range Hoods? We’re often asked: what’s the difference between a ducted range hood and a ductless range hood? Good question! A ducted range hood and a ductless range hood use different methods of ventilating the air inside of a kitchen. Vented Range Hood – A vented range hood vents air to the outside of the home via the ductwork. Ductwork for a range hood should be a smooth metal duct. It runs from the chimney of a wall mount range hood or an island range hood, or the top of an under cabinet range hood, and goes to the outside of the home through the wall or through the ceiling. Vented range hoods use aluminum grease filters or baffle filters to remove grease from the air during cooking. These filters can be cleaned and put back into the range hood. Ducted Range Hood – A “ducted range hood” means the same as a “vented range hood.” These are just two different ways of referring to the same type of air ventilation. Both a vented range hood and a ducted range hood are more effective than ductless range hoods, which are explained below. Ductless Range Hood – Ductless range hoods are usually installed when ductwork cannot be used, either due to cost or due to space constraints. For example, many times ductwork cannot be installed in an apartment home. Additionally, the installation of ductwork can add to the cost of a range hood project or kitchen remodel. The range hood then re-circulates the filtered air into the kitchen. Therefore, ductless range hoods are also known as “re-circulating range hoods.” Ductless range hoods ventilate the air with charcoal filters. The charcoal filters in ductless range hoods need to be completely replaced once they are saturated with grease; they cannot be cleaned and reused like the filters used in ducted range hoods. This entry was posted in Home Improvement, Indoor Air Pollution, Range Hoods and tagged air filter, duct, home improvement, kitchen, range hood, range hoods inc on November 11, 2014 by editor. …by these wondrous range hoods. This entry was posted in Home Improvement, Humor, Range Hoods and tagged 8th Wonder of the World, funny, Giza, humor, range hood, range hoods inc on November 7, 2014 by editor. The range hood keeps the kitchen clean and prevents grease from falling on kitchen décor and cabinets. Not only does this mean there will be less clean up to do later, but it also means your décor will last longer. The range hood will make a big difference in this area if you often cook at higher temperatures. The range hood is the perfect place for a light to illuminate the stovetop, so you can see what you’re doing without having to install additional lights or turn up the light in the whole kitchen. The range hood ventilates smoke, heat and smells, which makes the kitchen a more comfortable place to spend time. Imagine frying fish or indoor grilling without the range hood; the kitchen would fill with smoke and the smell of the food. Your clothes would retain the smell as well. Turning on the range hood helps avoid this and makes the kitchen more enjoyable. The removal of the smoke will also help you avoid setting off the smoke detector. The range hood also prevents smells, smoke and heat from spreading to other areas of the house. This is a concern because of the popular open kitchen layout in many modern homes. Cooking is a chemical process that produces the gas carbon monoxide. If left unchecked, this gas can cause health problems. Additionally, the chemical nitrogen dioxide is produced by gas stovetops. Nitrogen dioxide has been known to cause respiratory problems and irritate asthma in children. Turning on the range hood helps filter these chemicals out of the kitchen air and make it a safer place for homeowners and families to spend time. The range hood, due to its size and height, often becomes a focal point in the kitchen. The aesthetic of the range hood can take a kitchen from ordinary to fabulous. Before purchasing a range hood, you’ll want to decide between a ducted range hood and a ductless range hood. A ducted range hood ventilates air to the outside of the home via ductwork. However, it’s not always possible to install ductwork, such as in an apartment. A ductless range hood is better than no range hood at all, but it is not as effective as the ducted option. Remember, it’s important to maintain and clean the range hood, as well as the grease filters. Baffle filters and aluminum grease filters in ducted range hoods can be cleaned and put back in the unit. However, the charcoal filters used in ductless range hoods need to be completely replaced with new ones. Lastly, check the local building codes in your area to see if a range hood is required. If you have any additional questions about why you need a range hood or about how to purchase a range hood, call our staff today. This entry was posted in Cooking with Range Hoods, Home Improvement, Kitchen Design, Kitchen Safety, Range Hoods and tagged appliances, kitchen, kitchen appliances, kitchen decor, kitchen design, range hoods, range hoods inc on November 4, 2014 by editor.